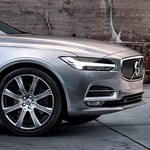 Since its inception, the Volvo V90 models we offer at Volvo Cars of Nashville have earned the respect of luxury SUV enthusiasts for the reliability and safety features expected from Volvo. Is comes with more than 35 standard safety items. The V90 contains performance features many may not expect. The first is Volvo’s powerful but efficient power plant. A 316 hp turbocharged 4 cylinder engine provides more than enough muscle to climb hills and for highway passing. Despite its strength, the V90 can achieve up 35 mpg in highway driving, to lengthen the distance between fuel stops on long trips. The V90 also provides an innovative Eight-speed Geartronic™ Automatic Transmission. The smooth gearbox allows the driver to control shifting without the need for a clutch. If the driver forgets to shift, the Geartronic has it covered and does the shifting on its own. The experienced and trained team at our dealership is prepared to answer all questions and help introduce the Volvo experience.